Just like the comic strip that introduced me to this joke once upon a time: Bloom County. To this day one of my all-time favorite jokes, which tells you everything you need to know about me. I was a child of the 80s. This fact has never been more evident than it was this morning upon discovering that Bloom County is back. 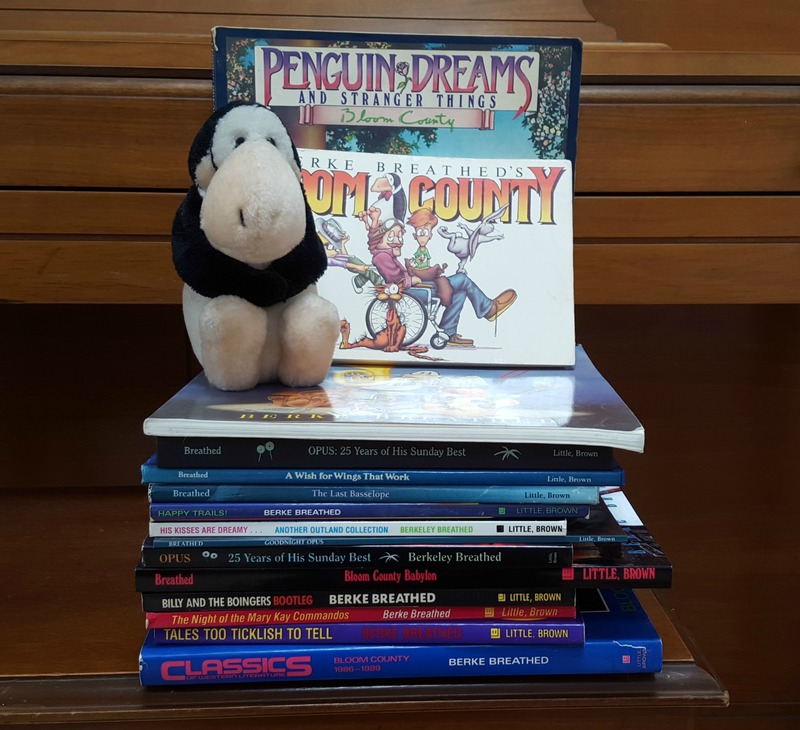 Bloom County, a comic strip created by Berkeley Breathed, was first published in December of 1980 and ran until August of 1989, pausing to accept a well-deserved Pulitzer in 1987. I quoted it relentlessly throughout my adolescence (and still quote it to this day). I drew hundreds of pictures of the various characters, mesmerized by the amount a simple pen stroke could convey. I don’t recall exactly when my imagination was first captivated by the absurdly charming cast, although I suspect it was shortly after it first appeared. A voracious reader, 9 year-old me would race home from school to sit at my grandma’s counter, legs mindlessly kicking the bottom rung of the stool while eating my afternoon snack, attention riveted on the day’s comics. There was something remarkably appealing about the cynical optimism portrayed by 10 year-old Milo Bloom – a bizarre balance of world-weary, been-there-done-that reporter, ebullient student and philosophical dreamer lazing afternoons away among the dandelion clocks in his favorite meadow. Add in neurotic Binkley and his Anxiety Closet, the massive intellect and curiosity of Oliver Wendell Holmes and the wide-eyed naiveté of everyone’s favorite penguin, Opus, and you have a foundation for greatness. 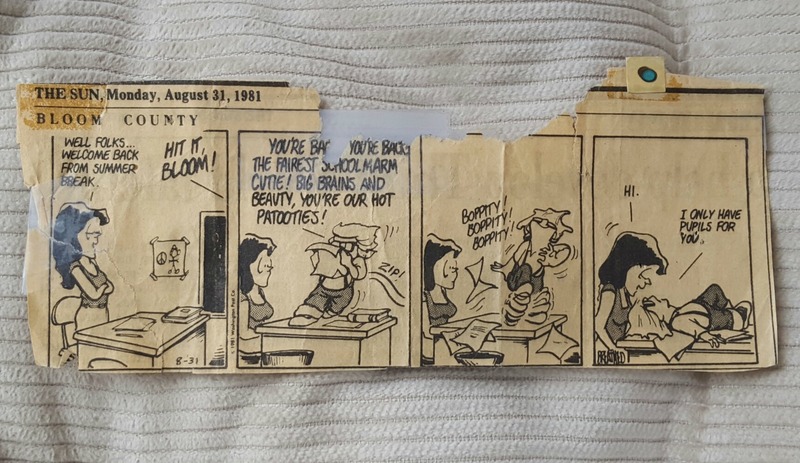 Can’t reliably find my car keys but immediately located this 34 year-old comic strip that used to hang in my locker at school. Topics ranged from friendship to music to law to love to politics to science to current events and back again. Nothing was off limits, with story lines often so completely ridiculous as to defy imagination. Clever and insightful writing paired with wondrous illustrations made it instantly appealing, even to a young girl who easily missed many of the nuances until re-reading the strips again years later. Remember Opus and the Hare Krishna? Milo taking candidate quotes out of context during a political interview? Cutter John and his crew confronting their own personal Death Star? Bloom County first taught me about social justice: speaking out for what you believe in while calling out that in which you don’t. It taught me that humor makes difficult situations more accessible, and can offer a common ground that encourages people from completely different viewpoints to engage in civil conversation. It taught me to never take myself too seriously. It taught me to laugh in the face of absurdity while never giving up hope. 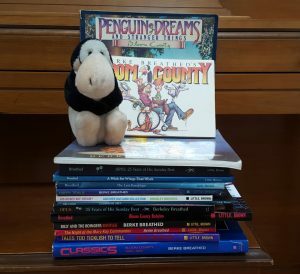 In the 25 years since Bloom County was last published, the news industry has undergone enormous change. One can’t help but think that it’s no coincidence that the strip returns with only 16 months to go until our next Presidential Election – 16 months that I was dreading. Now I, for one, will be very interested to see what intrepid reporter Milo Bloom – surrounded by old friends and new – has to say. The comic strips included above are clearly the work of Berkeley Breathed, and one hopes I’ll be allowed to include them here. The other photos are mine.